Godrej Natures Basket is India’s foremost online grocery store for the widest, finest, freshest foods. Godrej Nature’s Basket is the retail venture of Godrej Group and is today India’s foremost retail destination for the freshest and finest groceries. We offer a wide range of fruits, vegetables, authentic delicatessen, finest meats, irresistible bakery products and much more. Started in 2005, we have today morphed into an online & mobile grocery app platform and the leading premium gourmet & grocery store chain strategically located in Mumbai, Pune and Bangalore. We endeavor to expand our footprint across India and make online grocery, food & vegetable shopping a luxury experience. 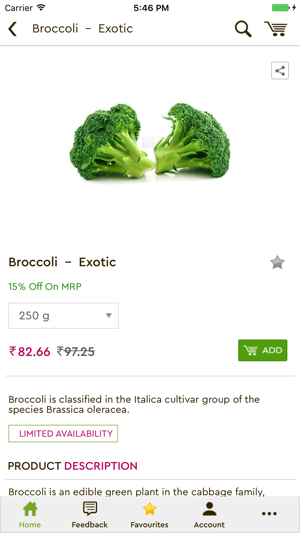 With over 30,000+ products and 1500+ brands Nature’s basket app offers you the best online grocery store at affordable prices. 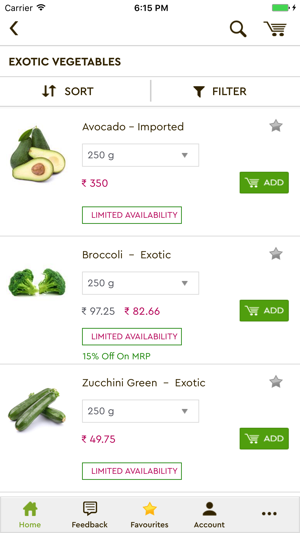 Standing true to the celebrated and trusted brand promise, Godrej grocery app yet again makes your online vegetable shopping a hassle-free process. Now you can buy grocery online in India with the ease of a dedicated grocery shopping app brought to you by the house of Godrej. We assure you the very best in International cuisine assortment, customer service, user friendly mobile app experience and product quality! Building on innovative technology and best-in-class customer experience, Nature’s Basket strives to offer the best online grocery shopping experience across major cities in India like Mumbai, Delhi, Gurgaon, Bangalore, Pune, Kolkata, Hyderabad, Chennai and more. Faster browsing with just a click! 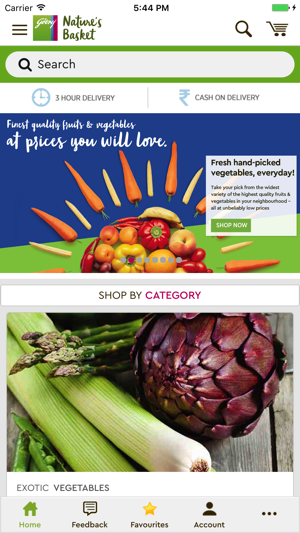 Nature’s basket online grocery store delivers exotic world gourmet food, organic vegetables & fresh fruits to more than 190 cities and 5000 pin-codes across the country. With time we are expanding our foot print to make epicurean shopping an indulgence for both in-store and online shoppers across India. Now simply enjoy your online grocery shopping in Mumbai, Delhi, Gurgaon, Bangalore, Kolkata, Pune and Chennai with the ease of a world class grocery app. - Enable Paypal Payment option. I have used this app on occasions since last year now, same issue has been occurring each time and they keep providing promise to fix it but it seems they dont mean it, they show a lot of products in their inventory which they donot really have, some of them are out of season fruits and exotic stuff, they ll call you n tell you they dont have it but will not still remove it from the list, you can order the same product 50 times a day, they ll keep telling you just before delivery that they don’t t have it but wont remove it from the list, recently i ordered fruits from them they send me all stale figs oozing out odoured fluids and i ll emphasize on my statement that none of the 6 figs they have sent were fit to be eaten, above all choosing a delivery slot doesn’t mean anything here coz they ll deliver early or very late and will show no professionalism at all. Its a waste of time to write to them or sending a feedback because they don’t care. They have achieved heights in abysmal service. Very poor app, even after emailing about it, i am surprised as a customer they do nit pay any heed. Somehow i strongly believe by now, the app or online shopping from their store is not so important. When i visit their store once in a week at times, i find good stock there, same thing when i order online, it is not available! Then comes the problem with app, for last 6 months or more have been trying to redeem the points while shopping through app (because i cannot redeem them in store) and i fail! I have 1100 points now and cannot redeem them, i am quite surprised by the poor performance consistency now. The management somehow stil lives in medieval era, only bothered about physical store, as if had to reluctantly open the online app because of customer pressure!! They just turn a blind eye and deaf ear to any problem regarding the app! I purchase a lot from Nature’s basket but their negligence towards this issue is unacceptable! Keyword search doesn’t work. Stocks are not matched to what’s available and not. There are no regular updates that even try to fix the bugs. Online payment always shows that it’s being processed while the store receives the order and that is confusing for the customer. No way to give reviews of your recent purchases. One has to write an email to support for any issue. Please update your app. While the rest of the world has adapted to mobile shopping, your app still has a lot of bugs and hiccups that need sorting and fixing.